In the next 3 years in the development of the enterprise — the creation of a full production cycle — Claas is investing around 120 million euros. It is planned that by 2015, the production capacity will increase to 1.5-2 combines thousands of pieces of equipment. Now the production capacity of the plant designed for a thousand cars a year. Parallel to continue production of tractors and the staff at the factory in Krasnodar will increase to 500-600. "The project is the second phase of the plant will create CLAAS in Krasnodar and Kuban generally strong demand for skilled workers and engineering workers," — said the ministry. 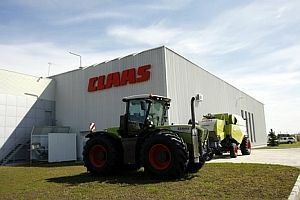 The company's factory Claas — LLC "Klaas" — opened in Krasnodar in 2005. Today, it produces the full range of Tucano combine harvesters and tractors collects Axion850, Xerion3300/3800.